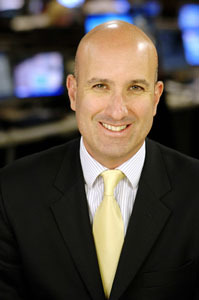 Newsman Angelos Frangopoulos fell in love with journalism at age 14, a passion that led him to CSU’s Bathurst Campus to study a Bachelor of Arts Communication (Journalism) before embarking on a career as a reporter, chief-of-staff and producer with Prime Television, the Nine Network and British Sky Broadcasting. At the helm of Sky News Australia since 2000, Angelos now divides his time between Australian News Channel, owner and operator of Australia and New Zealand’s leading multi-platform 24-hour news supplier Sky News, sitting on a number of boards including the Australia Day Council of NSW, the Victor Chang Cardiac Research Institute and the Walkey Foundation for Journalism, and raising four children with wife Rebecca. A proud member of the Charles Sturt University community, Angelos was recently named CSU’s Pro-Chancellor, Sydney, a position he takes up in 2015. Here Angelos shares with us some of biggest influences in his life. My childhood was...packed with great adventure. I was born here, but attended schools in Greece and Spain. At school I was the one with the most exotic (and delicious) sandwich fillings! Going to university was a great privilege....While my mother had a great education in Spain my father had come to Australia as a 16-year-old boy and his opportunities were severely affected by the Second World War. His education ended in junior school and he was very proud that I decided to pursue tertiary education. As a child, I was most curious about...technology and especially cars, a fortunate passion considering my room at CSU overlooked a rather famous racetrack. I chose CSU because … of the best journalism degree in Australia. My best experience at CSU... was living on campus. It was three years of fun with great friends (oh yes and some study). My worst experience at CSU... on a freezing winter's morning, running across campus in a panic to turn on Radio 2MCE's transmitter after I had slept in. At university I was inspired … by extraordinary lecturers, in particular Roger Patching and Dr George Kanarakis and my equally extraordinary fellow students, many of whom are my friends to this day. Today I’m motivated … by my wonderful wife Rebecca and four great children. In my profession it is important to… be passionate about what you do and never give up. I never dreamed I would … have the honour of meeting so many amazing people on my life's journey. The biggest influence in my life... has been my parents. They taught me to work hard, never lose sight of my goals and be ethical in all you do. My greatest achievement is... my family. Everything else comes second. The best piece of advice I ever received... was from my first boss, the late and much loved Peter Andren, who told me never to forget that my job as a journalist is to serve the community. The single-most important issue in the world is … understanding and acceptance of other cultures. The world could learn a lot from Australia's great multicultural history. One last thing... don't forget to give something back along the way. Australia will be a better, stronger place if we all embraced a little philanthropy.